In his cookbook Small Bites, Big Nights Govind Armstrong says: "There's mad love you can make to a lemon." Making lemon confit is like making love. It's slow and hot...and slippery. And totally worth the effort. According to wiseGEEK, "confit is a cooking term for a variety of foods, most often meats, preserved by being salted and cooked slowly in their own fat. 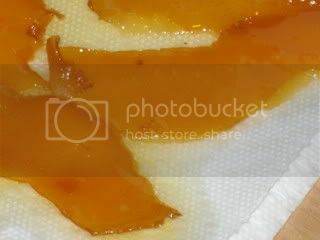 Confit can also be also a condimentof fruit or vegetables cooked to the consistency of jam. In addition to meats, confit refers to other foods, including garlic or lemons, cooked and preserved in oil or lard in a similar method." I had a couple Meyer lemons left that were squishifying rapidly, and so I made mad lemon love--err, confit--then used it to top an asparagus & goat cheese tart. 1. Peel lemon with vegetable peeler in long, wide strips. Place strips, pith side down, in a tall-sided skillet. 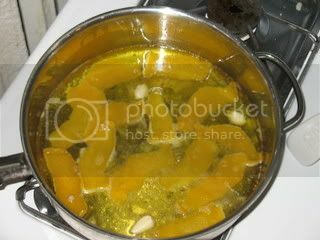 Add juice from peeled lemons and the garlic cloves, then add enough olive oil to cover. 2. Let simmer on low 1 hour. Remove the garlic if it starts to brown. 3. Remove the pan from heat and let peels cool in the oil. 4. Carefully transfer the peels to a paper-towel lined plate. The peels are very soft & delicate; they will tear easily. 5. Keep the peels and the oil in a covered container in the refrigerator. 6. The lemon confit can be chopped and served with poached eggs on toast, with olives for bruschetta, in pasta, on salads...the possibilities are nearly endless. 2. Thaw one sheet of puff pastry at room temperature. Then, unfold it onto a lightly floured board. Cut the pastry on the folds to make three rectangles (you could also roll it out to make one large tart). Roll each piece slightly, then place on a baking sheet lined with parchment or silicone mat. 3. With a sharp knife, lightly score dough 1/2 inch (or 1 inch if making one large tart) in from the edges to mark a rectangle. Using a fork, pierce dough inside the markings. Bake until golden, about 10 minutes. 4. Remove pastry shell from oven. If the middles have risen, lightly pat down with a fork to make room for the fillings. Sprinkle each tart with Parmesan. 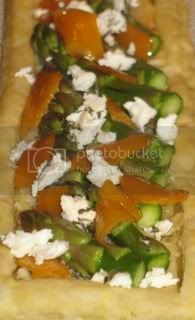 Trim the asparagus spears to fit inside the tart shell (I placed them diagonally) and arrange in a single layer. Brush with the confit oil. Dot with chopped lemon confit and crumbled goat cheese. 5. Bake until spears are tender, about 15 minutes, but be careful not to burn the crust. I am submitting this recipe to Barbara of winosandfoodies.com, who hosts a blog event called A Taste of Yellow in conjunction with LIVESTRONG Day (which is on May 13 this year), the Lance Armstrong Foundation's one-day initiative to raise awareness and funds for the cancer fight. With her event, Barbara challenges other food bloggers to make a recipe featuring yellow foods "to remember those loved ones who are no longer with us, support those still fighting, and celebrate with those who have won the fight." Check Barbara's blog on May 13 for the recipe round-up! Kelly I so have to try making lemon confit. It sounds o delicious and versatile. Thanks for supporting LIveSTRONG With A Taste Of Yellow. Mmmm. Interesting use of the Meyers. I made meyer lemon confit earlier this year too. And I love them on pizza. So not only do I think your recipe sounds great, I think that is one of the best names for a blog ever!